HUGOMORE42 I'm generating a model with a library called Tangible. The development of the library seem to have stalled, especially at the most crucial point. Creating a rhombus tower with more than 2 dimensions.. 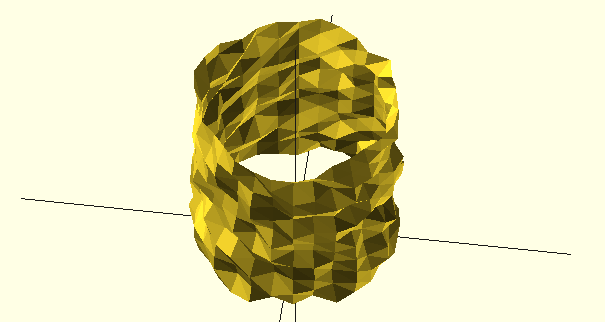 So I spend (long) evening and a day trying to grok 3D modeling with code. I've implemented the function for generating such a tower within the library itself and I might open-source the code shortly! After tinkering a while this is where I am now: Imagine the possibilities, of printing objects, like lampshades or anything else really that represent a data-set? I for once would love to have a series of lamps that tell the story of Whatsapp messages with friends. Or maybe a company that shows the stock price as a big 3D-printed of laser-cut ornament at the reception.